"The history of astronomy is a history of receding horizons." The next monthly business meeting will be on May 2nd, 2019 starting at 7:00 pm at the EIOLC, Pal Dows, 1365 Ivanhoe Rd. Directions to Pal Dows/EIOLC are on the Web Site under Monthly Meetings. The next public presentation will be April 27th 2019 at 8:00pm. See the Public Events Page for more details on next year's events. The books and media available in the associaton's library has been updated. You can download the list on the "Documents" page under the heading Books and media available in the EIOLC library (543kB pdf). Last updated 5 October, 2018. Lists 779 items, about 20 of them new since June, 2018. The CAA Tri-Fold Brochure was updated in October, 2018. You will also find that on the Documents page. Download a Flyer with all of the 2019 Event dates and times (204 kB pdf) or business card size schedule (106kB pdf). Download a map (276 kB pdf) to Pal-Dows Preserve. 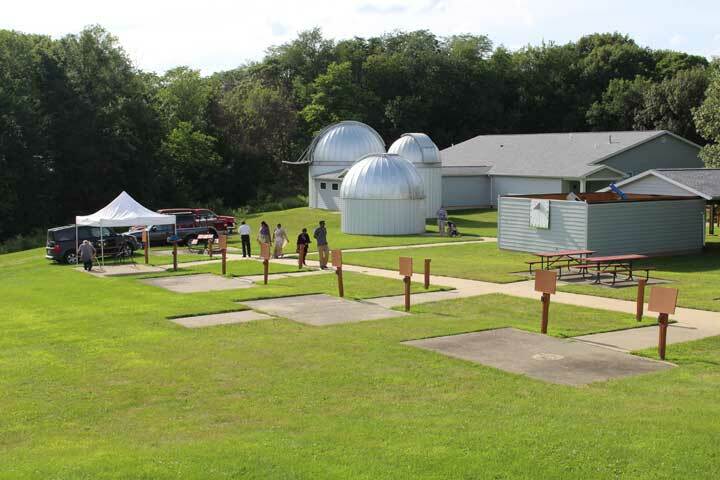 Members of the Cedar Amateur Astronomers (CAA) host public and private group events at the Eastern Iowa Observatory and Learning Center. The EIOLC is located on the grounds of Palisades-Dows Preserve, between Mount Vernon and Ely, Iowa. As well as being a member society of the Astronomical League, the CAA is a member of NASA's Night Sky Network, a nationwide coalition of amateur astronomy societies committed to sharing their time, their telescopes, and their enthusiasm for astronomy with their local communities. The CAA hosts public viewing nights during the year and information about those public observing nights can be found on the Events page of the website. The Society serves its members, the public, local school districts, youth groups, as well as college and university classes. We have also hosted state and regional conventions in Cedar Rapids. Since its founding, the Society's membership has grown from 12 members to over 100. Our members come from all walks of life and with all levels of interest in astronomy. The Cedar Amateur Astronomers, Inc. was founded on September 29, 1979, and incorporated in 1980. Based in Cedar Rapids, Iowa, the CAA is a tax-exempt, non-profit 501(c)(3) organization. 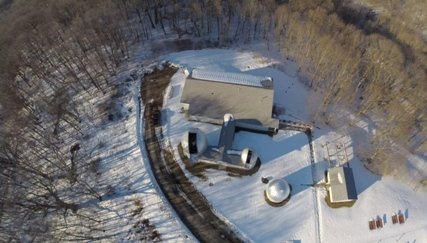 The Eastern Iowa Observatory and Learning Center at Palisades-Dows Preserve is jointly operated by the Cedar Amateur Astronomers and the Linn County Conservation Board. The Eastern Iowa Observatory and Learning Center at Palisades-Dows Preserve. The Eastern Iowa Observatory and Learning Center at Palisades-Dows Preserve. Winter aerial view. The CAA is on Facebook! Cedar Amateur Astronomers, Inc. Powered by Joomla!